Three-wire outdoor wire receptacle with snap cover. Parallel grounding motor base. #9991. Single gang cover. Cover will lock in open position. Gasket and screws included. Suitable for wet locations when cover is closed. For use whenever weatherproof protection is required for an outdoor receptacle. Rugged metallic construction. State-of-the-art powder coat finish. Self-closing lids assure weatherproof protection when the receptacle is not in use. Includes installation hardware. For use whenever weatherproof protection is required for a single-gang box. Self-closing lids assure weatherproof protection when the receptacle is not in use. Rugged metallic construction. State-of-the-art powder coat finish provides maximum weatherability and scratch resistance. Includes installation hardware, gasket, and multi-lingual instructions. NEMA 3R. For use whenever weatherproof protection is required for an outdoor receptacle. Rugged metallic construction. State-of-the-art powder coat finish. Self-closing lids assure weatherproof protection when the receptacle is not in use. Includes installation hardware, gasket, and multi-lingual instructions. Die-cast aluminum. Automatic closing lid. Heavy-duty gasket and stainless steel screws included. Suitable for wet locations when cover is closed. For use whenever weatherproof protection is required for an outdoor receptacle. Self-closing lids assure weatherproof protection when the receptacle is not in use. 2-gang vertical mount. Rugged die-cast construction. State-of-the-art powder coat finish. 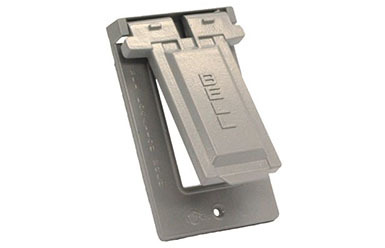 Vertical mount covers are padlockable, 1/4" diameter hole. May be mounted to box or device. Includes installation hardware, gasket, and multi-lingual instructions. A proven way to prevent up to 20% of home air loss. Made of UL-listed fire retardant material.